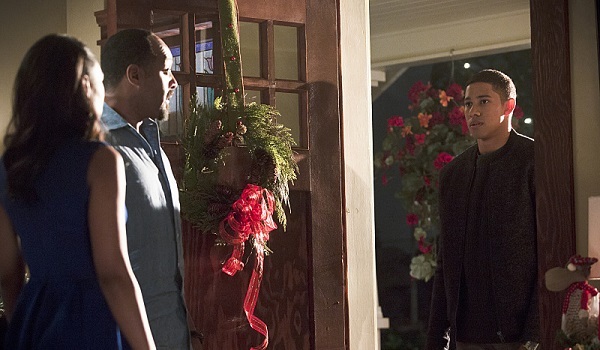 Somebody throw Sly and the Family Stone’s “Family Affair” on the old record player, for the West clan is about to get a little bit bigger over on The Flash. Below is our very first look at the newest member, Wally West. Tis the season to show up on people’s doorsteps possibly unannounced, fa-la-la-la-la-la-la-la-lash. (No apologies for that.) Wally will be arriving on The Flash during next week’s episode, titled “Running to Stand Still,” just in time to sing Christmas carols with Iris, Joe and the S.T.A.R. Labs team. The fact that no one is smiling right away perhaps implies that this isn’t the best time for formerly secret offspring/siblings to be showing up. But hey, that’s one hell of a wreath. We’ve known for a while that Keiynan Lonsdale would be playing the part of Wally West, but it wasn’t that long ago that his existence was acknowledged by the show. Iris’ mom Francine showed up a few episodes back to let everyone know that she was dying, and that news came coupled with the reveal that she was pregnant for another child when she left Joe. That child is Wally. Comic fans know that Wally West ends up becoming Kid Flash and, later, the third iteration of The Flash proper. It’s not clear exactly what the TV show will be doing with him as far as superpowers goes, but assuming the character is as enjoyable as everyone else, he could have a long future in live-action. After all, Harrison Wells is busy messing with serums that make people faster, so who’s to say that serum won’t be making its way into Wally’s bloodstream at some point? 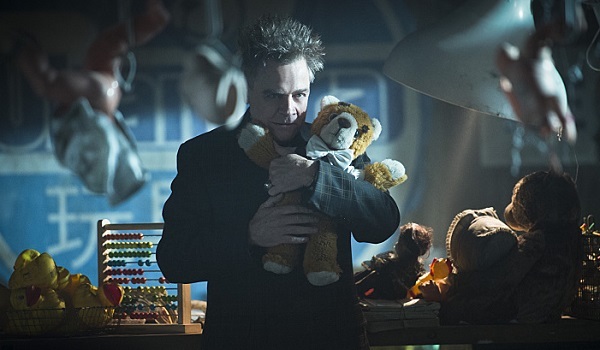 Wally West is far from the only character popping by “Running to Stand Still.” The episode centers on Liam McIntyre’s Mark Mardon (The Weather Wizard) returning to Central City to break Leonard “Captain Cold” Snart out of prison, which likely answers how Snart is out on the streets when Legends of Tomorrow kicks off. Oh, and Mardon is also trying to free James “The Trickster” Jesse, which means that we’ll be getting to see more Mark Hamill for Christmas. Consider the image below a stocking stuffer. We have a lot of questions about what’ll happen in the episode, but the biggest one is obviously “What’s up with the abacus?” Find out when The Flash returns to its non-crossover form next Tuesday night on The CW.